October 13, 2017 — The Australian federal government’s love affair with coal has reached new levels in recent years, with federal ministers bringing chunks of the mineral into parliament and donning high-visibility mining vests as pro-coal publicity stunts. Yet against this backdrop, one Australian state has managed to break global records in the renewable energy space. 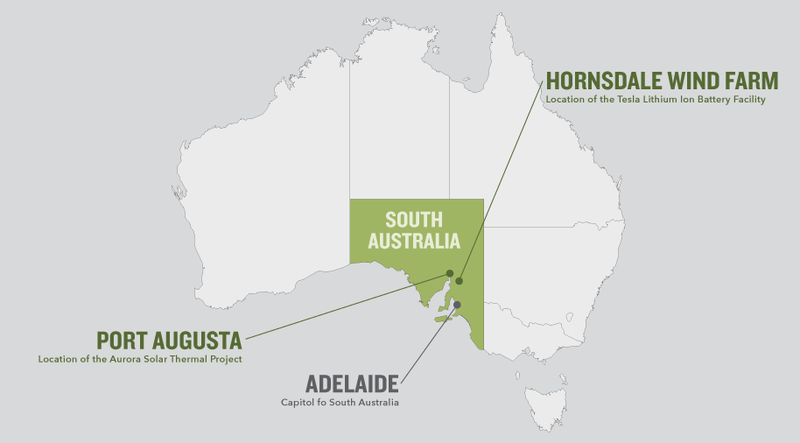 Recently, South Australia’s state government has announced not one but two record-breaking renewable energy projects: the world’s largest solar thermal power plant and the world’s largest lithium ion battery installation. Together, these projects will help the state surge well ahead of its already ambitious renewable energy targets while delivering a clear challenge to its coal-obsessed federal counterpart. In recent years Australia has been taking giant strides away from renewables. In 2014, it repealed its nascent carbon tax. The Renewable Energy Target has been slashed, coal is being championed, and the Clean Energy Finance Corporation — the government’s “green bank” — and Australian Renewable Energy Agency have both teetered on the brink of annihilation due to funding uncertainties and cuts. South Australia’s state government, on the other hand, has invested heavily in renewable energy over the past decade, particularly during the reign of incumbent premier Jay Weatherill, who came to power in 2011. This trend is largely thanks to an abundance of wind and sun that has supported a boom in wind and rooftop solar, says Richard Webster, principal advisor in the Low Carbon Economy Unit in the South Australian Department of the Premier and Cabinet. It’s also come about because of South Australia’s unique network challenges. “South Australia has always been a little bit disadvantaged as far as energy is concerned, because we’re at the end of the NEM [National Electricity Market] and we’ve also got a long spindly transmission network,” Webster says. But wind and solar can be generated close to where they are consumed, with the added attraction of enabling the state to become more self-sufficient in its electricity supply. The South Australian government has also made it easier for new wind farm projects by simplifying the developmental approval process, he says. As of 2016, 48 percent of South Australia’s power came from renewable energy — bringing it close to its 2020 goal of 50 percent, which it set in 2014. In March this year, the state government also launched an AU$550 million energy plan for the state, with the aim of ensuring “more of the State’s power is sourced, generated and controlled in South Australia.” The plan includes an AU$150 million renewable technology fund, a new gas power plant and an energy security target. South Australia no longer has any coal-fired power plants providing a stable baseload of power since the Northern Power Station in Port Augusta closed in 2016, with its owner Alinta Energy saying it had become increasingly uneconomic. Following the closure, a local community group began lobbying for the plant to be converted into a renewable energy facility, not only for clean energy but also for the jobs that such a project might bring to the town. 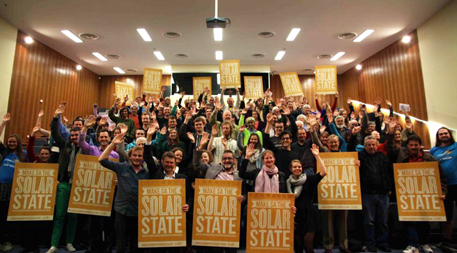 Local citizens rallying for renewable energy and jobs played a pivotal role in bringing the Aurora solar thermal project to South Australia. Photo courtesy of Repower Port Augusta. The Repower Port Augusta campaign attracted the interest of U.S. renewable energy company Solar Reserve, which in August 2017 won the contract to supply all the South Australian state government’s energy needs with a solar thermal plant. The solar thermal plant proposal beat a variety of competitors, including natural gas. “It’s turning the corner for solar thermal in that we believe we can now compete head-to-head against conventional energy projects and provide not only clean energy projects but also be cost-competitive,” says Solar Reserve CEO Kevin Smith. The 150-megawatt Aurora Solar Energy Project, the largest of its kind in the world, will deliver enough energy to power more than 90,000 homes and meet 100 percent of the state government’s own energy needs. The power plant will consist of a large field of around 12,000 heliostats, or sun-tracking mirrors, that focus the sun’s heat energy on a receiver at the top of a central tower up to 240 meters (790 feet) high. The receiver is essentially a tank whose walls are lined with tubes filled with a molten salt solution — potassium and sodium nitrates — that is heated to around 560 °C (1,040 °F). That heat will be exchanged and used to drive a steam turbine and generate electricity in much the same way as the coal-fired power plant it replaces. Smith says Solar Reserve plans to make as much use as possible of local skills and resources, including workers who lost their jobs when the coal-fired power plant closed. The advantage of solar thermal over solar photovoltaic or wind power is storage, Smith says. Battery storage is one way to address the intermittency issue. That’s why the South Australia state government is also investing in the world’s biggest lithium ion battery, to be built by Tesla near Jamestown, in the mid-north of South Australia, and operational by December 1, 2017. The battery will be paired to a wind farm under construction by French company Neoen. Webster says the 100-megawatt battery is meant to provide stability for South Australia’s energy grid. “One of the great things about the battery is it will be able to provide an extra bit of energy when needed for a short period of time,” Webster says. This stabilizing effect will be particularly valuable during South Australia’s hot summers. A heat wave resulted in blackouts earlier this year when electricity demand outstripped a supply that was reduced by lower-than-forecast wind generation and forced outages at some diesel and natural gas–fired power stations. Poster Child or Case Study? 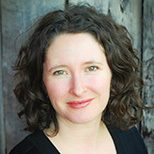 South Australia’s commitment to clean energy is highlighting the lack of a coherent energy policy at the federal level while setting an example for other states, says Amanda McKenzie, CEO of Climate Council, an independent, not-for-profit information source on climate change. It’s not necessarily going to be smooth sailing for South Australia as it transitions from conventional energy to renewables, warns Alex Lloyd, project manager of the Energy Storage Knowledge Bank at the University of Adelaide, noting the policy and logistical challenges the government has to navigate. “We privatized the electricity industry, and it’s de-aggregated, so [the] generators and the transmission companies and the distribution companies and the retailers are all more or less separate companies,” Lloyd says. South Australia also has some of the highest electricity prices in Australia. Elon Musk is a genius. His physicists appreciation of reality allows a far brighter future than we had all foolishly supposed. Musk's childish bravado, "100 days or it's free", is leaving his automotive customers in the lurch, apparently there isn't enough battery production yet to supply South Australia, Puerto Rico, and to slowly ramp up Model 3 production. All those customers will need to wait a little longer, something most of them anticipated anyway. Of course this is supposition, but it does stand to reason. America loves Elon Musk. I hope South Australia comes to appreciate him half as much for keeping his word to the people who love there, down under. South Australia is totally dependant on the Brown coal fired electricity provided by the Interconnector from Victoria. The similar Ivanpah solar power installation in the Mohave Desert experienced problems with insects being drawn toward the brightly illuminated tower and in turn attracting birds, all of which were injured or killed by the heat. Has there been a similar problem with the South Australia plant? I haven't heard whether this problem has been remedied in the case of the California project. Rasa, At one stage we were totally dependent on Kerosene, then Gas lights before electricity. We were also totally dependent on Steam and the horse&cart. So what's your point?